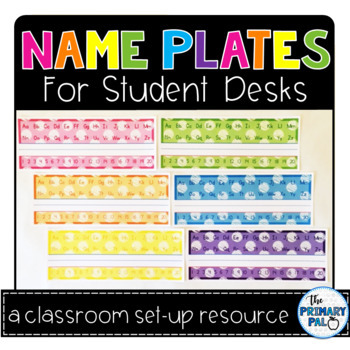 These name plates for student desks have enough space for student's first and last name to be written on. The upper portion of the name plate includes uppercase and lowercase letters in alphabetic order. The lower portion of the name plate includes numbers 1-20. The alphabet and numbers are simple, but provide students with a quick reference that can be useful to have easily accessible during writing and math time. The design of the name plate is intended to be simple and clutter free so that it isn't overstimulating for your young learners. There are two name plates per sheet (you get all 6 colors that are pictured), once they are cut down they are each 9 1/2 inches wide and 3/12 inches tall. Print out multiple copies on card stock for a full class set!